10 # Bulk case - Omena Organics Organic Dried Tart Cherries infused with Omena Organics Apple Juice Concentrate. No Added Sugar. Dried Organic Wild Blueberries 6oz. 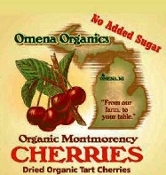 Organic Dried Cherries, Montmorency Tart 6oz. Organic Dried Cranberries 6oz.